The University of Rochester Libraries are committed to supporting a diverse and inclusive environment for students, staff, and faculty. The Libraries encourage, support and celebrate people of all races and places of origin, people with disabilities, people of diverse religious beliefs, sexualities and gender identities, and the most vulnerable in our community. UR libraries are promoted as a safe space to Learn, Discover, Heal, Create, and Make the World Ever Better for all. Libraries champion equitable access to information and entry to cultural dialogue for underrepresented voices. Staff members are empowered to promote equity, diversity and inclusion through our library services, collections, spaces, programming, and recruitment efforts. The UR Libraries Committee on Diversity and Inclusion was founded in 2016 to ensure that diversity and inclusion remain in the forefront of library operations through collaboration and education. Committee members are passionate, dedicated librarians and library staff who agree to serve a two year term, from River Campus, Edward G. Miner, and Sibley Music Libraries. Mark Puente, Association of Research Libraries (ARL) Director of Diversity and Leadership Programs since 2009, will be joining us in March for our Workshop Series. In addition to directing the ARL’s Diversity and Leadership Programs, he was a 2003 American Library Association’s (ALA) Spectrum Scholar and the recipient of ALA’s 2015 Ethnic and Multicultural Information Exchange Round Table Distinguished Librarian award. Mark obtained his MLIS from the University of Arizona’s School of Information Resources and Library Science. He is the Coordinator of Digital Projects and Special/Gift Collections at the University of Illinois at Urbana-Champaign’s University Library. You can watch Mark's presentation on our YouTube Channel. Dr. Kristin Hocker coordinates the University’s Safe Space program, has served on the Executive Committee of the Latino Professional Alliance, and volunteers at the Gandhi Institute for Nonviolence. She was awarded the 2015 President’s Diversity Award for her work on the Safe Space program. Dr. Hocker received her EdD from the University of Rochester’s Warner School of Education. 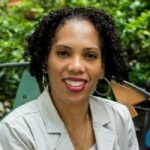 She is currently the Organizational Development Specialist in the Human Resources department at the University of Rochester.